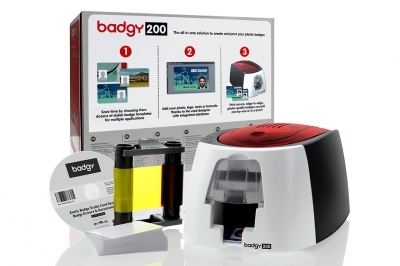 The Badgy200 is a good entry-level card printer solution. Evolis Badge Studio®+ allows you to print from a database, making it easy to retain information for reprinting cards and to organize your card printing in batches. The consumable pack sets you up with a ribbon and 30 mil CR-80 PVC cards (100), so you’ll be able to start printing immediately upon set up. For pre-configured bundles featuring this printer, please visit our ID System Bundle page. Capabilities: single side printing; monochrome & color printing.